Hurray! 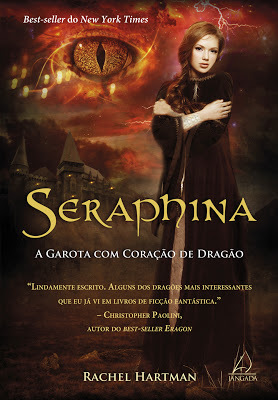 I hope Brazilian readers are enjoying the book! 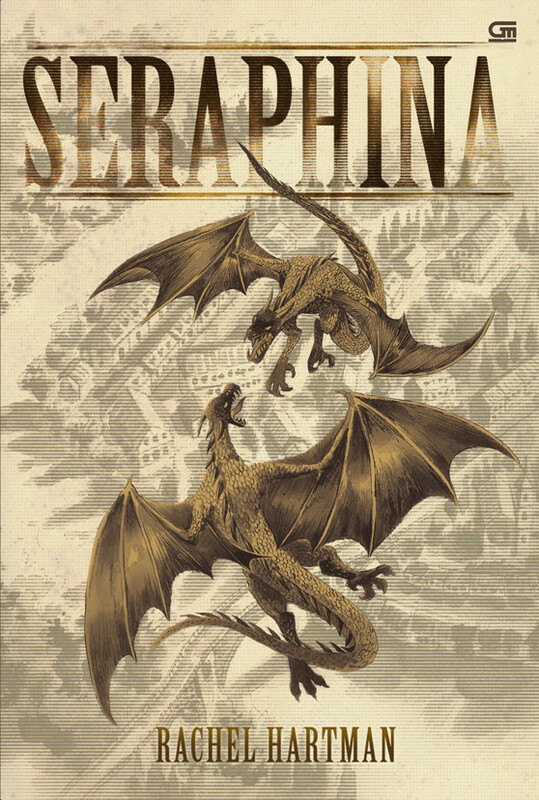 And then, coming out at the end of May, we’ve got the Indonesian Seraphina! My Indonesian translator informs me that this is original art by Martin Dima. I love how it’s reminiscent of the North American cover – sepia tones, Medieval city – while still being entirely its own thing. Happy (late and early!) birthdays, international editions! It is humbling to realize how many places people are (and will be!) reading my book. 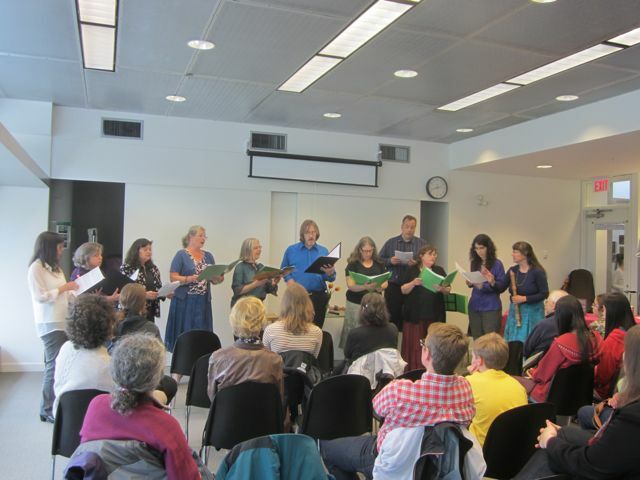 Last weekend I did a reading at McGill Library in Burnaby, where my madrigal choir (plus an extra musical guest) very kindly agreed to sing, and where my friend Els very kindly agreed to take some pictures. 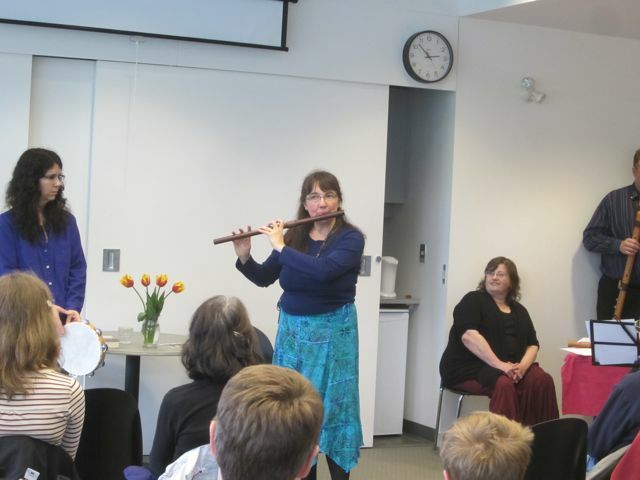 The second half was devoted to our musical performances. The choir sang two Renaissance songs: “Belle Qui Tiens,” which is a pavane (like the pavano Seraphina dances with Kiggs); and “Mille Regretz” by Josquin Desprez, a goosebump-inducing piece of music which was an inspiration for the book itself. Too bad you can’t hear us, because we were AWESOME. 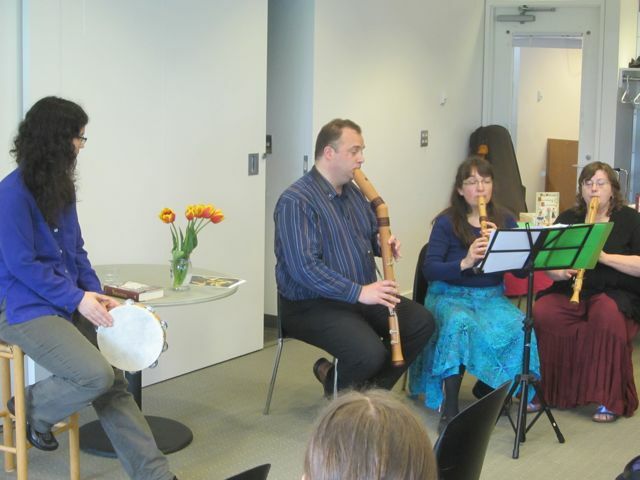 An intrepid recorder trio then played Praetorius’s “Bransle de la Torche”, which is one of my favourite Medieval dance tunes. Did you know recorders came in so many sizes? 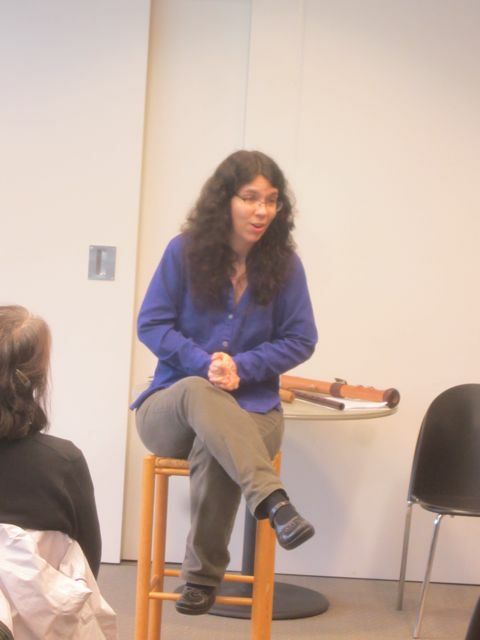 I even demonstrated the bransle, or bits of it. 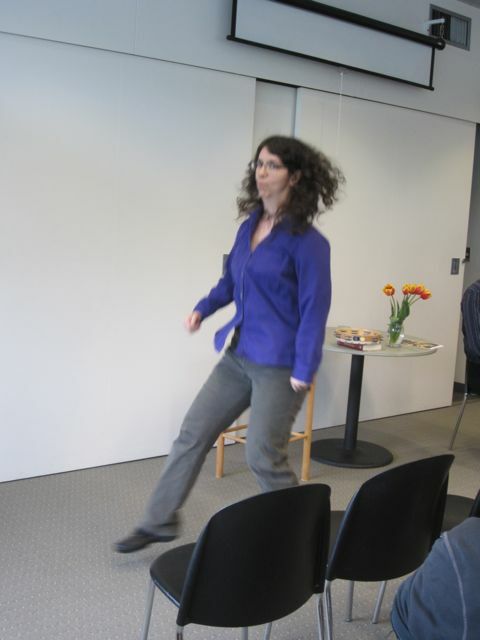 It’s really more of a line dance, but I’ve never been embarrassed about dancing with myself. My idiosyncratic bransle includes moves from the Charleston. This isn’t one of them. 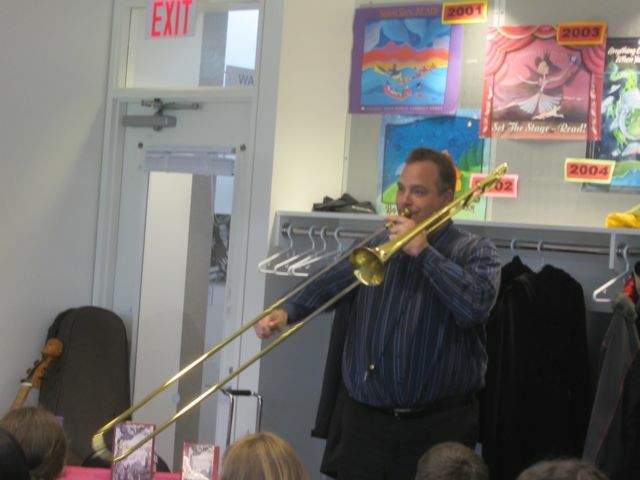 For the grand finale, Lise’s cousin Nathan gave us a demonstration on his amazing bass sackbut! That’s right, friends, the sackbut is a real thing. I didn’t make it up. No, it’s not a trombone. 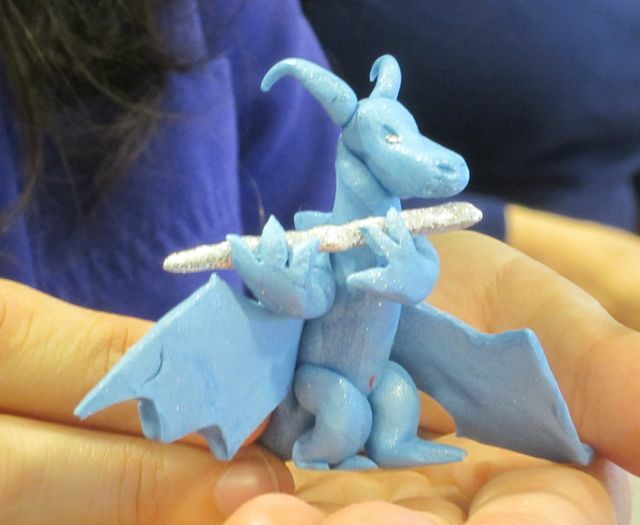 It’s a proto-trombone. At the end of my visit, I received some tulips, a special bookmark, and this, a lovely piece of art from a talented young lady named Caitlin. It’s on my mantle now, between Apollo and Poseidon. So that was last weekend. 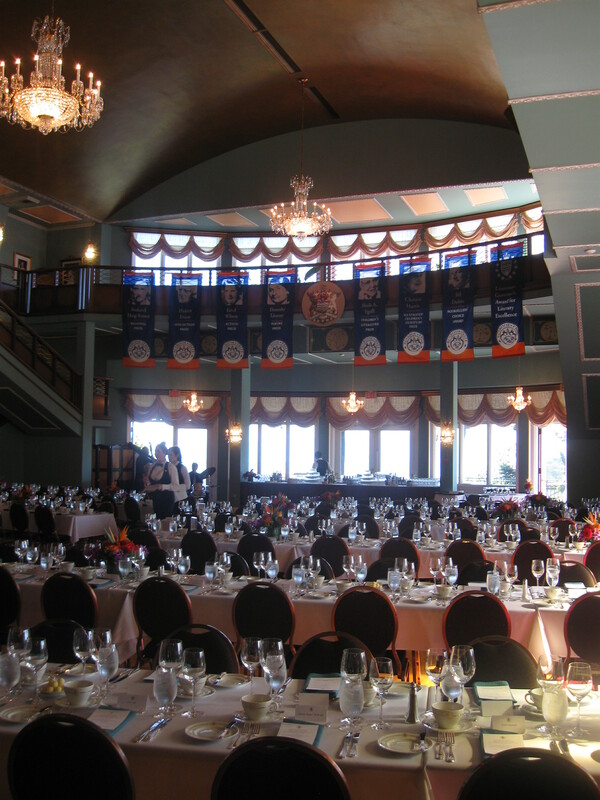 THIS weekend, I got to go to Victoria, the capital of British Columbia, and attend the BC Book Awards Gala Dinner. No point keeping you in suspense: I didn’t win the award I was nominated for, alas. 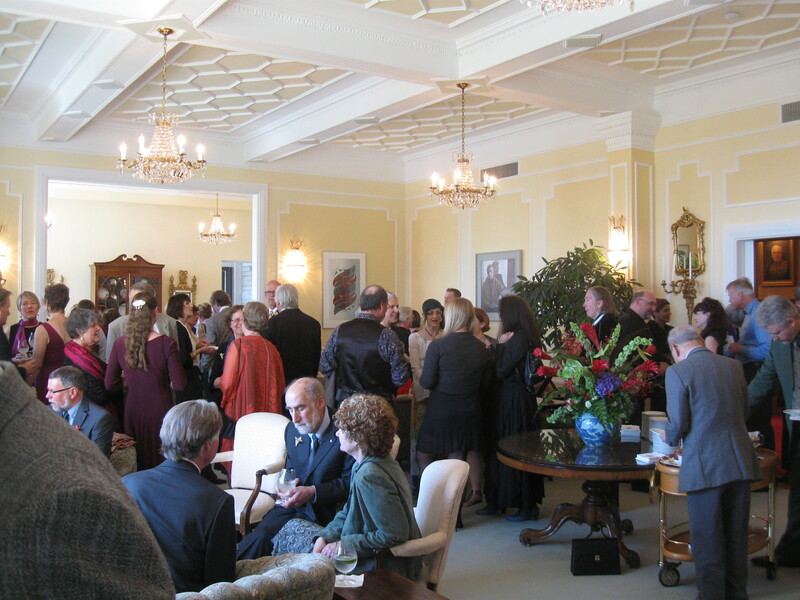 But I had a cultural experience most Canadians never get to have, a reception and dinner with my province’s Lieutenant Governor. The Lieutenant Governor is, at a provincial level, what the Governor General is at the national: the official representative of the British Crown. I have never been anyplace so officially fancy in my life. 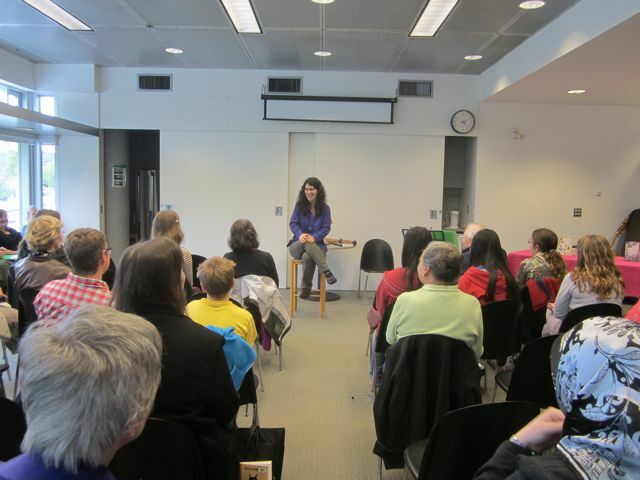 BC literary lights – I knew five people in the entire room, and two were my husband and son. That’s the VIP reception, pictured above. My son was SO EXCITED to be part of it. He’s totally planning to brag to his friends that he was a VIP. I’m pretty sure this is not what his friends are going to imagine he means. After the awards ceremony, we had a fancy dinner involving things like “White Asparagus Panna Cotta” (it was white! And gelatinous! ), and “Stinging Nettles & Fresh Goat Cheese Custard” (which didn’t sting, even a little). My son was far and away the youngest person present, and he got quite a bit of attention for being patient, well-behaved, and a good eater (even of the unusual foods, above). I may not have won the prize, but I did get a weekend that my whole family is going to remember for a very long time, and that is worth a lot. And who knows, maybe I’ll be back someday. Edited to add: Geez! I should tell you who DID win! It was Caroline Adderson, for her book Middle of Nowhere! I haven’t read it, but I’d better correct that. All the winners and nominees are listed here. What a writing culture we have here in BC! My friend John told me about this recently, but it took me a while to work up the nerve to listen to it. It’s an interesting bit of experimental music. It’s also 45 minutes long, so don’t feel you have to sit through the whole thing. You get a pretty good idea of where it’s going just a few minutes in. I was astonished how distorted it was by about seven minutes, utterly unintelligible at twelve. I’ve got it running in the background. Right now, it sounds like blurry chords. It’s an interesting way of thinking about human voices, though. Even while speaking, our voices are made up of different frequencies. The room echoes back some frequencies more readily than others, and by the end of this piece that’s what you’re hearing, notes that were always present in his voice, selected by the properties of the room. The notes are all there, even when we don’t perceive them. It’s getting more and more drone-like. It reminds me of this harmonica I had as a kid that would make eerie mooing noises if one didn’t blow into it with enough force. I suspect we’re headed toward even the rhythm of speech disappearing.